Michelle and I are visiting my brother’s family in Arkansas for the week of Thanksgiving. 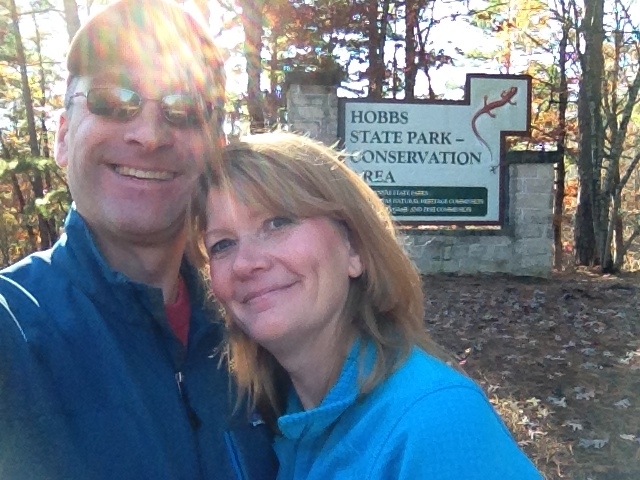 Today, we went for a hike in nearby Hobbs State Park and Conservation Area. The Pigeon Roost trail winds up and down through gentle forest valleys, and provides access to a branch of Beaver Lake. We saw and heard only a few birds–about a dozen. I was expecting to see more. Perhaps this was a function of the time of year and/or untrained birding senses. The brochure at the visitor’s center stated that this trail was named after a now-extinct passenger pigeon. The trail is well-marked. Although, it appears that the signage in several locations is set up for hikers going around the loop in a clockwise direction. We hiked counter-clockwise. After the hike, we had lunch at The Rail in Rogers, Arkansas. I enjoyed the pork shanks and the margherita pizza! Note, I’m not posting a trail map of this hike yet, because I just learned that Google has changed its maps service. It’ll take me a little time to figure out if I can still use Google maps for this blog.